Chef Raul Thomas is a talented culinary artist with over 20 years of experience… and it shows! We met Chef Raul at private event in downtown Atlanta. He has a dynamic and upbeat personality that is contagious. His services are only for catering events and private dining. 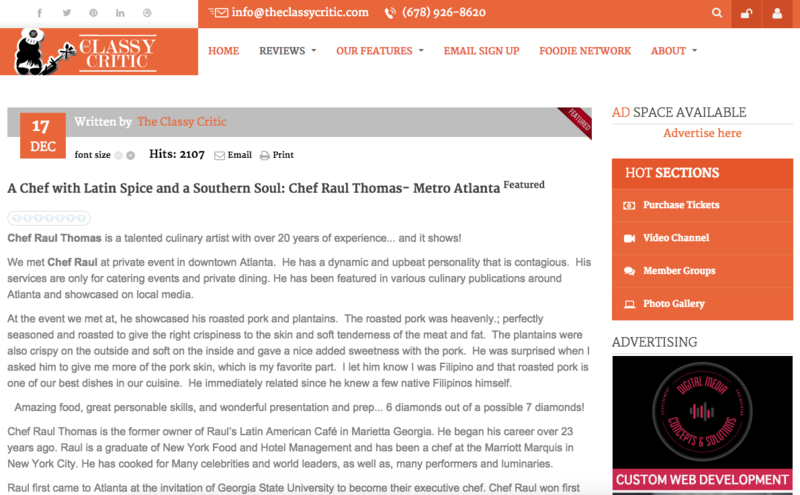 He has been featured in various culinary publications around Atlanta and showcased on local media. At the event we met at, he showcased his roasted pork and plantains. The roasted pork was heavenly. ; perfectly seasoned and roasted to give the right crispiness to the skin and soft tenderness of the meat and fat. The plantains were also crispy on the outside and soft on the inside and gave a nice added sweetness with the pork. He was surprised when I asked him to give me more of the pork skin, which is my favorite part. I let him know I was Filipino and that roasted pork is one of our best dishes in our cuisine. He immediately related since he knew a few native Filipinos himself. Amazing food, great personable skills, and wonderful presentation and prep… 6 diamonds out of a possible 7 diamonds! Chef Raul Thomas is the former owner of Raul’s Latin American Café in Marietta Georgia. He began his career over 23 years ago. Raul is a graduate of New York Food and Hotel Management and has been a chef at the Marriott Marquis in New York City. He has cooked for Many celebrities and world leaders, as well as, many performers and luminaries. Raul first came to Atlanta at the invitation of Georgia State University to become their executive chef. Chef Raul won first place in the Men Cooking for a Change, March of Dimes Cook Off, Real Men Cook of Atlanta, and many other food competitions both in New York and in Atlanta. Suckling pig is the easiest animal to roast in the world. They call it cochon de lait in Louisiana (or France, for that matter), lechón in South America, maiale in Italy, or—my favorite—Spanferkel in Germany. Because a young pig’s flesh is so rich in collagen and has yet to develop strong, robust muscle fibers, roasted suckling pigs is incomparably moist, tender, and delicate, bursting with sweet, sticky juices. It’s pretty much impossible to overcook suckling pig flesh. The only tricky part—and in reality, it’s not that tricky—is getting the skin crisp. The best way to get a suckling pig for yourself is to go to an actual butcher and ask them to custom order one. In fact, many supermarkets with a good meat counter will do it for you around the holiday times. As for the pig’s size, any pig under about 40 pounds will yield extremely tender meat, and you should plan on at least a pound of dead weight per person—more like a pound and a half, since this is the holidays and everybody should be eating more. What makes suckling pig stickier and more succulent than a full-grown hog? Collagen. This connective protein is abundant in the flesh of young animals that have yet to develop strong musculature. As collagen is heated, it converts to gelatin, which is what is responsible for making all of the drippings sticky, as well as lubricating and coating every strand of flesh you extract.